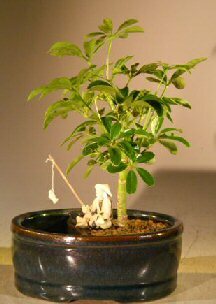 This is the tree that we recommend if you are inexperienced with bonsai or you do not have a green thumb. In our opinion it is one of the easiest bonsai trees to care for and it is a very beautiful trouble-free evergreen. If you don't know which tree to purchase as a gift for someone, this is the tree to select. Our tree features tiny umbrella shaped leaves forming a dense green canopy. On the other side of the planting is a well that holds water. We include a fisherman figurine along with a fishing pole and ceramic fish.